Long before I stumbled into forest gardening, I always loved allotments. My parents had one, with chickens and runner beans, hot sun and fresh peas. And then my young family had one for a short while, amidst the most magical of places, with fish-filled ponds, warm brick walls, rickety hide-outs and tangling paths. What I like most about allotments is the sense of cobbled together idiosyncratic usefulness in a private place. Nothing is on show for the outside world, it is personal and enclosed. It is vernacular. And vernacular is not a style, it cannot be copied successfully. This [shanty town] is the picturesque in its raw state, almost before it became the picturesque. This, and you have to believe me, is what generation after generation of highly trained, highly prized, highly esteemed archictect has attempted to achieve but never could because these guys can never rid themselves of that troublesome gene marked art. John Nash, Edwin Lutchens, Oliver Hill: this… this is what you tried for and never attained. It’s the difference between representing and being. This nails my inner disquiet about “traditional gardening”. Quite frankly, I find much of it pointless, because much of it is manufactured, to be copied for artificial show, for representing. 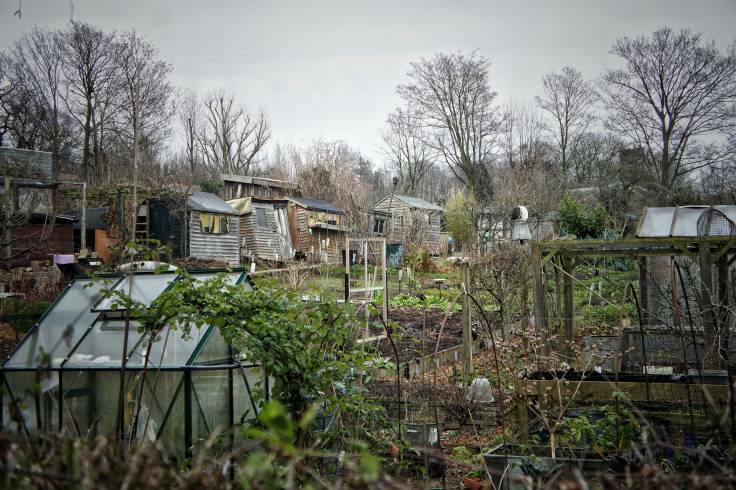 The best gardens are like allotments: practical and private places shielded from prying eyes, places that are for being. And the art that is practised there is a personal art. In the same vein, Stewart Brand writes beautifully in How Buildings Learn, exploring “The Low Road” and functional, adaptable, usable and ultimately livable buildings (the BBC series is available free on YouTube). And this is why I’m so drawn to forest gardening. It is innately practical, founded in the desire and necessity of growing produce, working with nature to lighten the workload whilst unknowingly contributing to an emergent beauty. It’s like foraging in an underplanted orchard, a jungly allotment. The ultimate in vernacular gardening. Heaven.